How Far Apart Should Solar Path Lights Be Spaced? Solar landscape lighting comes with tons of perks. With no requirement for wiring or outlets, they definitely make outdoor lighting a whole lot simpler. Plus, since they’re entirely powered by the sun, they provide a small electricity savings compared to electrical lights. Adding pathway lights helps prevent accidental falls and increases your home’s curbside appeal—that’s a lot of benefits for a little light! What If You Just Don’t Get Enough Sun? As a general rule, plan on placing lights six to eight feet apart to keep your pathway bright and well-lit. But don’t be afraid to space them even closer, especially if you want a particularly vivid effect. In fact, if you already have an overhead light or dimmer installed nearby, you can go even wider than eight feet apart. It really all depends on what you prefer. However, if you’re adding the lights as a safety feature along a pathway, you’ll want to carefully weigh the brightness when you decide how frequently to place them. 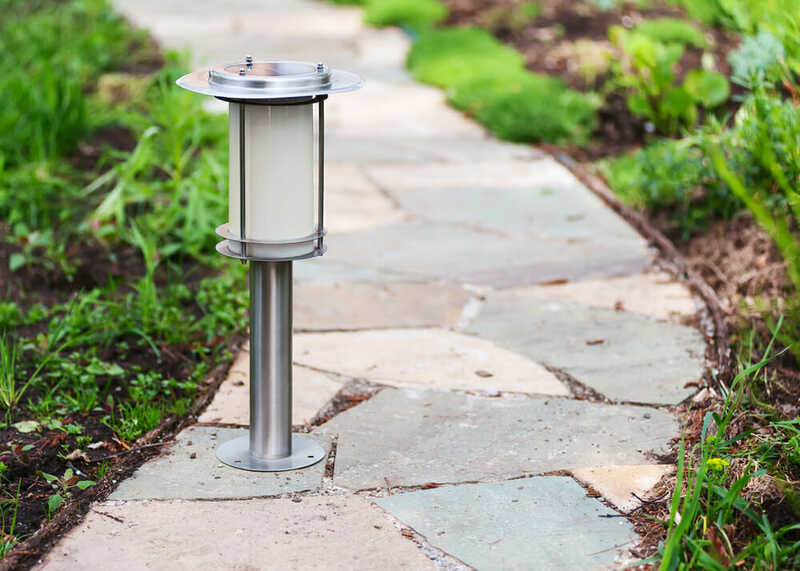 Electric pathway lights are typically twice as bright as solar, so you’ll need to use more solar lights than you’re used to to get the same effect along your path. Additionally, solar lights may perform better or worse depending on the amount of shade you receive in the area. Solar path lights don’t necessarily require direct sunlight, but you’ll definitely get better results if they regularly receive at least six to eight hours of full sun a day. The quality of the lights matters a lot, too. This is one place where it pays not to pinch pennies. Cheap or bargain solar lights may not work properly, or they may generate only a feeble light, compared to higher quality models. Look for a product that features a large LED bulb and more solar cells. Also check the packaging for the light’s wattage or lumens. A 100 watt incandescent bulb generates about 1,700 lumens—so the higher the number, the brighter the light. 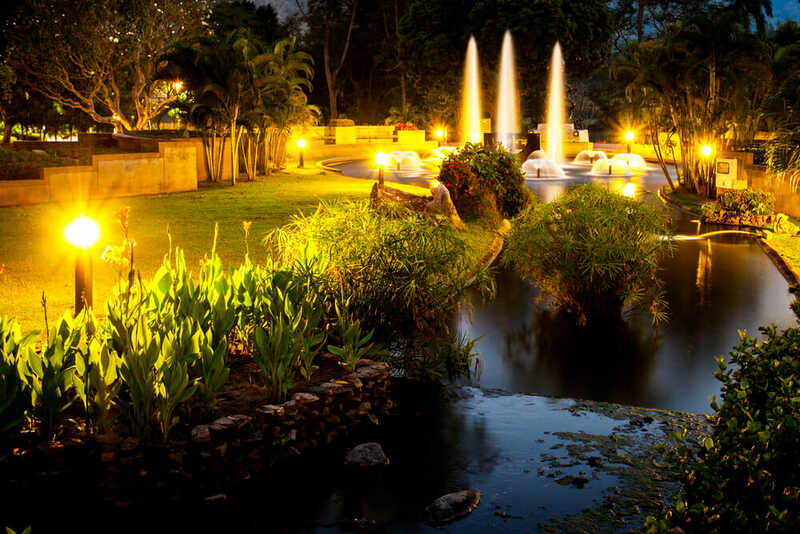 Installing landscape lighting offers a chance to play around with various lighting situations and decide what you want for your yard. And since solar lights don’t have to be wired, they definitely afford you the opportunity to get creative and try out some innovative effects that might be difficult to achieve with electrical lights. Specifically, try your hand at one of these different lighting techniques. Uplighting: Place lights on the ground along walls or other barriers and position them upward to create a bright burst of light. Or try setting lights against tree trunks or bushes to highlight standout foliage. Downlighting: Placing the light higher and angling the source downwards, known as downlighting, is a good way to diffuse light across a larger surface area, such as over a patio or deck. Grazing: Similar in concept to uplighting, grazing highlights a textured material, like a stone wall or veneer, letting and shadows play across the different surface areas. Silhouetting: Positioning a single light behind a stunning tree or other feature of interest shows off this piece by flooding it with back light. Solar Spotlights: Solar landscaping lights can even replace floodlights and other outdoor safety lighting on doors and near the driveway. Solar spotlights typically light as effectively as a 40 watt bulb, so several lights clustered together can create a very bright effect. Many models even include motion-sensors, as well. If you like the idea of solar landscaping lights, but just don’t get enough sun in your area, you don’t have to give up on your dream of a sun-powered pathway. Get in touch with a solar landscaping professional who can help you install a remote photovoltaic panel on your roof, garage, or other sunny spot in your yard. They can then connect that panel to your solar lights to boost their performance, even when it’s cloudy. As far as offering a convenient alternative to electrical lights, solar pathway lighting really can’t be beat! Wondering what else you can power using solar cells? Check out our archive of solar articles for more ideas!